William Bruce sat at the corner of Laidlaw Street and Gloucester Street, off Paisley Road. Laidlaw Street was once called Dundas Street. 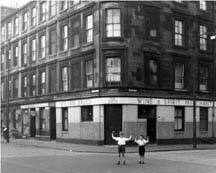 There has been a pub on this site since the 1870s, William Graham occupied the premises then, he also had a pub on Rutherglen Road. In the 1890s Mr P Robertson ran the pub, his old blend of Scotch whisky “Glendhu” was well known in the area, retailing at 10d a gill. Thomas Cooke acquired the licence in 1899, he also ran a pub in King Street. William Bruce then took over the business in 1901. When he died the licence was transferred to his wife Hannah. The pub stayed in the same family until it was demolished in the late 1960s.